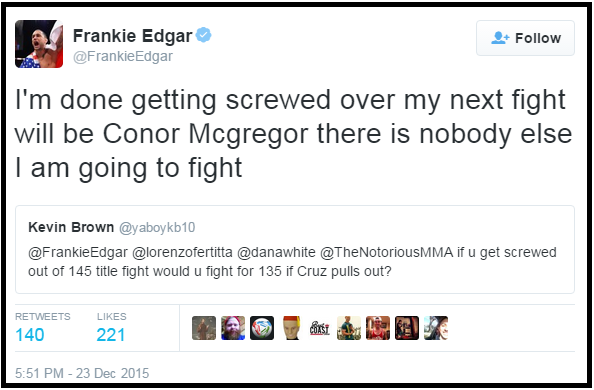 Frankie "The Answer" Edgar, the number two ranked featherweight fighter in the Ultimate Fighting Championship (UFC) did an impromptu question and answer session today on Twitter. The New Jersey native fielded questions from fans who mostly asked about a possible match-up between him and Conor McGregor. If the bout pushes through, it will be for the belt which McGregor wrested in brutal fashion from Jose Aldo early this month in just thirteen seconds. However, the UFC remains mum on whether Edgar will be facing McGregor next. It can be recalled that even before McGregor won the featherweight belt on UFC 194, there were rumors going around that should he come out victorious, he will have three options on how to go forward. One, give Aldo a quick rematch. Two, defend the title against Edgar. And three, move up to lightweight and fight for yet another title for the winner between Donald Cerrone and Rafael Dos Anjos. After the fight with Aldo and before the match between Cerrone and Dos Anjos, McGregor's team was very vocal in asserting that their ward is going to challenge the lightweight champion next. Many believe that the McGregor camp was rooting for Cerrone to win. Cerrone is an American. He is a big draw in the sport. If he wins and faces McGregor next, it's going to be an event that can possibly surpass the numbers generated by UFC 194. Unfortunately for McGregor, Cerrone got scorched by Dos Anjos in just sixty-six seconds. McGregor can still decide to move up to lightweight and face Dos Anjos but the Brazilian isn't that big of a draw. McGregor is never shy in following where the money is and right now, fighting Edgar would likely make him more money than fighting Dos Anjos. McGregor could give Aldo a rematch but the UFC doesn't seem to be that interested in such a proposition. There's another fighter who might get the next chance against McGregor. His name is Nate Diaz. No way in hell is this fight going to be uninteresting. Just imagine the trash talk between the two fighters in the build-up for the fight. But McGregor's team seems to be adamant on fighting for the lightweight belt. If they insist on fighting the champion, then Diaz is off the menu. Right now, McGregor's choices are Aldo, Dos Anjos, and Edgar. For sure, Aldo will agree to a rematch should it be offered to him. Dos Anjos has been goading McGregor lately to come up and fight him. And Edgar is becoming more aggressive in calling out McGregor. In his Twitter Q and A, Edgar said, "I'm done getting screwed over. My next fight will be Conor McGregor. There is nobody else I am going to fight." Since failing to win the featherweight belt from Aldo in February of 2013, Edgar went on to win his next five fights, the last of which was a first round knockout of Edgar Mendes. Emusauce: Hey Frankie, How would you feel if you had a rematch with Jose Aldo for the interim featherweight belt? Edgar: I want to fight for the real belt. Bereezey_Brill: Are you fighting McGregor next or is the UFC still protecting him? Edgar: He's been protected since day one. Bcrespo: What's the next move if Conor fights RDA instead? Edgar: I'm only going to fight for the belt next even if I have to sit it out. HadiHawa: Do you think you can beat Conor in his home country? Edgar: I'll beat Conor in Ireland, Las Vegas, in a phone booth and he knows it too. Ace_js: If McGregor won't stay at 145 to face you, would you face him at 155? Edgar: I'll face him at heavyweight if he agrees to fight me. Uhzair786: Do you think McGregor is really that good? And why? Edgar: He's a good fighter but he has not met his match. My style is bad for him. This is why he refuses to fight me. Mtysver: How do you feel about Conor's tremendous size advantage and range? Edgar: I was the champ at 155. I fought much bigger and better guys than him. He is a one-dimensional fighter.